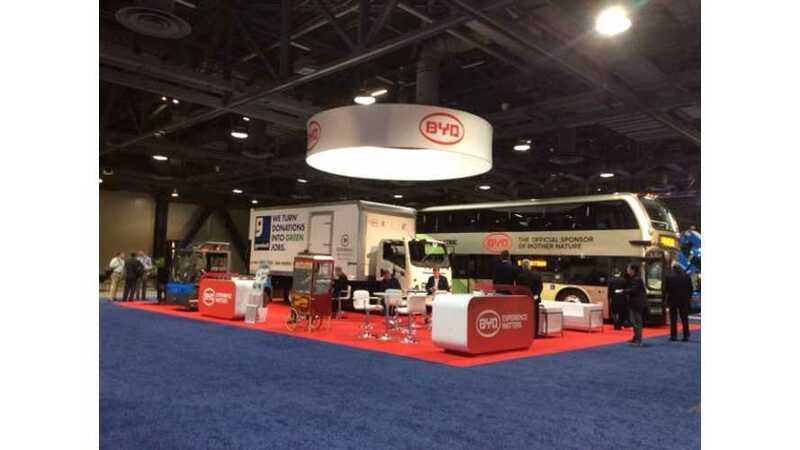 BYD presents at the Advanced Clean Transportation (ACT) Expo in Long Beach, CA its all-electric T7 truck with 124 miles (200 km) of range. It's the first from 11 commercial delivery trucks that will be built for San Francisco Goodwill, a nonprofit dedicated to making communities stronger by turning donated goods into jobs. TheChinese manufacturer equipped the truck with 175 kWh battery, which makes the 124 miles of range seems realistic. "The new zero-emissions electric truck will be used by SFGoodwill to collect and transport donated goods in San Francisco, San Mateo and Marin counties. SFGoodwill’s donation collections alleviate pressure on local landfills and support job training programs for people struggling with unemployment. SFGoodwill gives donated items a second life and people a second chance." "The new BYD T7 battery-electric medium-duty truck is over 20’ long and has a GVWR of 23,600 lbs. The T7 features a 175kWh charging capacity and has an estimated range of 124 miles with minimal battery degradation." "The electric truck fleet project was supported by the California Climate Investments program, which provides economic incentives for achieving reductions in the emissions of pollutants, particularly in disadvantaged communities. Matching funds were from the Bay Area Air Quality Management District and an in-kind match from SFGoodwill." “We are eager to deliver the first electric delivery truck for SFGoodwill, an organization that creates thousands of jobs and improves the quality of life in our communities. Our reliable zero-emissions technology will be a great addition to their operations,”.